Meatballs in a crock pot are a hearty appetizer EVERYONE just loves! Whether you are going to the office potluck, a Super Bowl Party, or hosting for the holidays, count on these meatballs in crock pot with bourbon flavor as your go-to dish. Everyone will want your recipe! 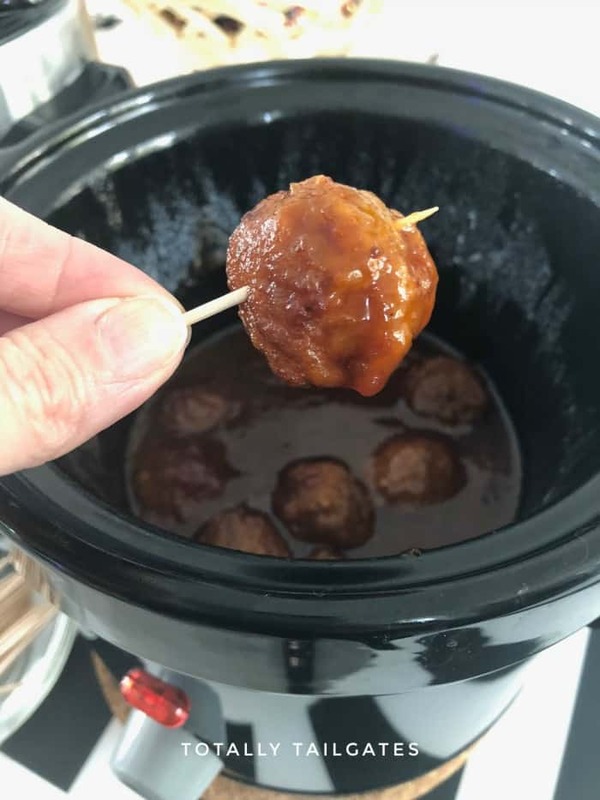 Hi, this is Heather from Totally Tailgates stopping by with one of our family’s favorite meatballs in crock pot appetizer recipes. Crock pot Bourbon Meatballs have a secret ingredient…brown sugar…which melds with the bourbon oh so beautifully. Meatballs in crock pot with bourbon flavor are a hit at parties and a cinch to make. I’ve played with variations of this recipe over the years and finally nailed the proportions to meet our family’s tastes. These little gems can hangout for hours during your shindig in a crock pot with zero attention. No stirring, monitoring, or temperature adjustments. It’s a low-maintenance appetizer for sure. I’m just not a high maintenance kind of girl in the first place, so these meatballs in crock pot recipe is right up my alley. Keep a bag of frozen meatballs in the freezer in case you need to pull together an amazing appetizer in a flash. The ingredients for these meatballs in a crock pot with bourbon flavor are pantry staples which make this recipe the Ultimate Appetizer! No doubt, these meatballs in a crock pot will make another appearance at our house on Super Bowl Sunday! I’ve always thought the Monday following the Super Bowl should be a national holiday. Kind of like New Year’s Day! We stay home for the Super Bowl and make PANS of Buffalo Chicken Dip and Football Cocoa Rice Crispy Treats. We stay up late and that alarm clock rings waaaayyy too early on Monday morning! When our daughter was in elementary school, we made a BIG deal out of watching the game & commercials together. Our coffee table turned into buffet central – the perfect height for little ones to graze on chips, fried mac & cheese bites , carrots and juice. Good old-fashioned family fun! 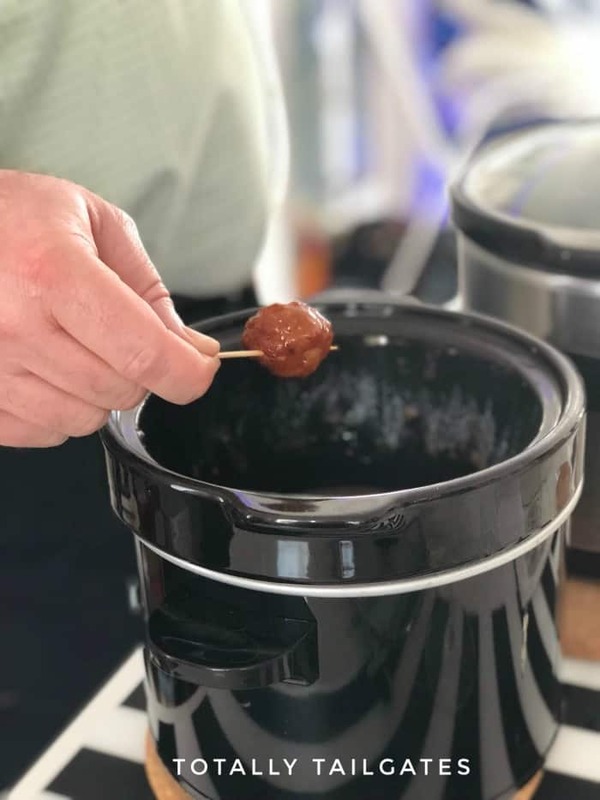 We’ve learned a couple of tricks of the trade along the way with all of our tailgating and when it comes to meatballs in crock pot, we’ve got you covered! 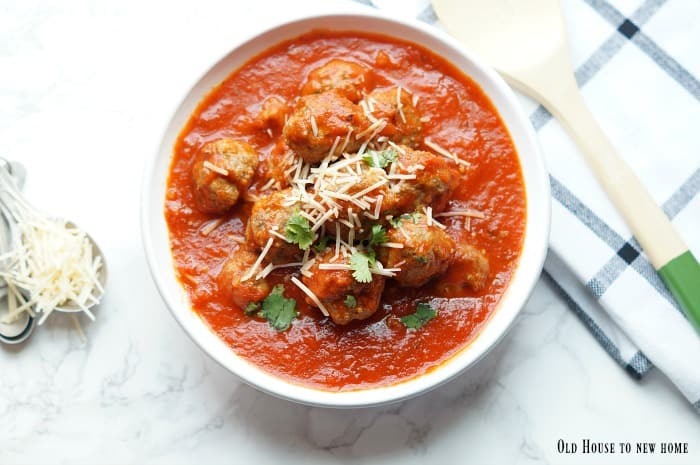 Frozen meatballs will save you time and energy, but if you like using fresh meatballs, you need to make sure that you cook them quick so that they will not fall apart in the crock pot. For fresh meatballs, you do not need to cook them all the way through before throwing them into the crock pot. You just need a good sear so that they will stay together. 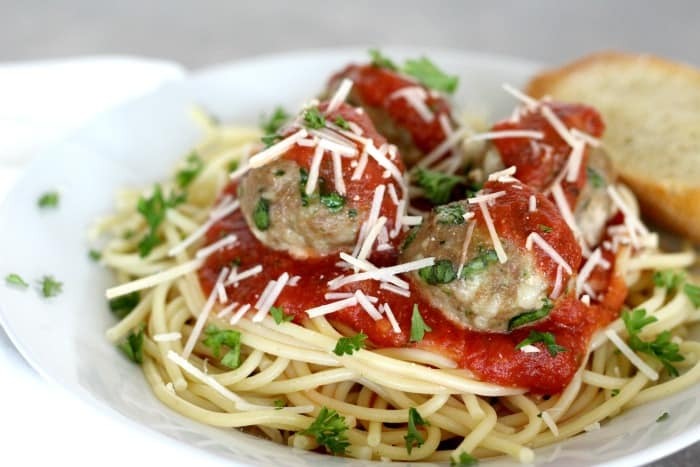 Be sure to give them a good stir before serving and work the edges so that it is not impossible to clean once your meatballs are all gobbled up. 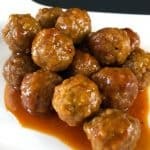 There are tons of other flavors that you can make for meatballs in a crock pot as well, but your base ingredients will be the brown sugar and ketchup for most recipes. You can make these ahead of time and let them just warm in the crock pot so they’re great for taking to events because once you get there you just throw the crock pot back to warm. You probably will not need to run to the grocery store to make this appetizer because you’ll have your ingredients right in your pantry – YAY! Although, I’m always up for an impromptu Super Target run. 🙂 Just sayin’. So, grab your brown sugar, ketchup, honey and a dash of lemon juice. And of course, your bourbon! Mix it all up, throw the sauce over the frozen meatballs and let that slow cooker do its thang….for one hour on high. I just know you and your family will LOVE these as much as we do! Happy tailgating! 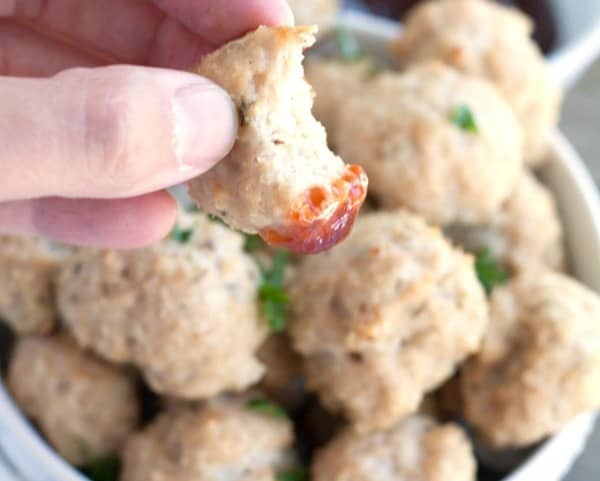 These meatballs made in a crock pot with bourbon flavor are the perfect tailgating appetizer or party meatball appetizer. They’re easy to transport because you can just keep them in the crock pot. Plus, they’re easy to serve. Just grab toothpicks and you’re good to go! These meatballs in a crock pot with bourbon flavor are a hearty appetizer that everyone will love. Spray the interior of a 6 quart slow cooker with non-stick cooking spray. Place frozen meatballs in the bottom of the slow cooker. Mix together remaining ingredients in a medium size bowl. Pour over frozen meatballs. Cover and cook on high for 1 hours. Meatballs can stay in the slow cooker on a warm setting for 3-4 hours after the first hour of cooking. 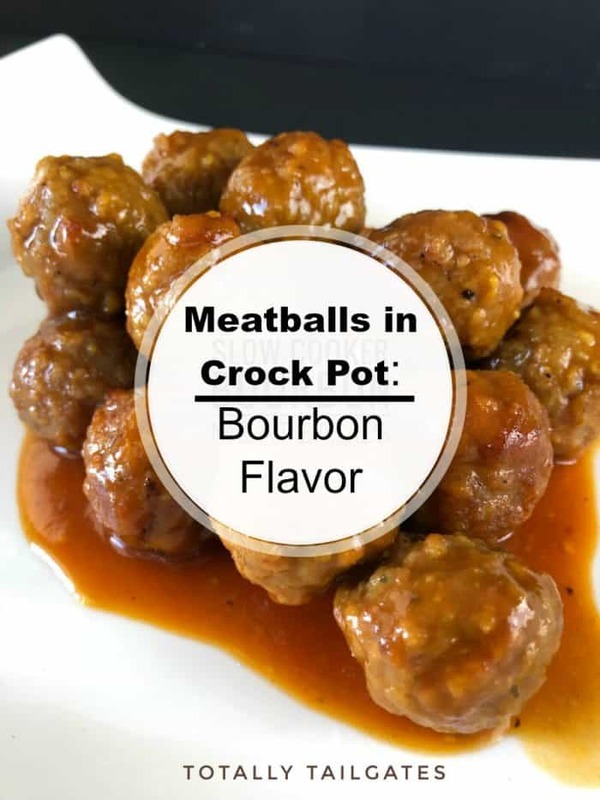 If you liked this Meatball in Crock Pot: Bourbon Flavor Recipe you might also like….